I am a light sleeper and with each kid I feel like it’s gotten worse and worse. I wake up with every little noise that they make- loud rustling of blankets, a falling binkie, a loud snore, etc., etc. I then go in to check on them and make sure they are okay. Now I recognize that makes me somewhat crazy and I should just ignore these small noises and go back to sleep. If I don’t go check though, I lay there and assume the worst. So whatever, I’m crazy and I’ve accepted that. What I couldn’t accept though was the mornings where Tim would get up with the kids and I would have a chance to sleep in for a bit and I couldn’t. I could not sleep AT ALL because I obsessively listened to everything that was going on downstairs. Even if the kids weren’t being particularly loud I would then wonder “Why aren’t they being loud?” “Has he given them breakfast yet?” “Did I just hear him say nap? It’s not the baby’s nap time yet.” I would obsess about every little thing that they were doing even knowing that Tim was perfectly capable of taking good care of them on his own. Again, I am crazy. So in order to try to actually be able to relax on those special mornings, I got a pair of ear plugs. 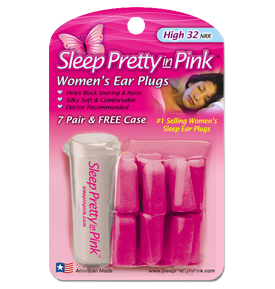 I have a pair of the Hearos Sleep Pretty in Pink. I only wear them after Tim gets up with the kids because clearly I still need to obsess about their noises all night. So Tim gets up with them, I pop the plugs in, and….it’s magical. I can still hear a little bit of muffled noise when I first put them in but then when I doze off I hear nothing – nothing. Getting these ear plugs was one of the best things I have done. If you are a crazy sleeper light sleeper like me, you should definitely give them a try. Best part is you can request a free sample from the Hearos website. They do have a maximum number each day so you might have to check back a few times or you could just pick them up at your local drug store for just a couple of dollars. It is so worth it. DO IT!